And more likely than not, your organization already uses some sort of social media dashboard. However, does your dashboard do everything possible for your brand’s specific social needs? It doesn’t matter if you’re an agency working with multiple brands or an enterprise handling dozens of accounts, you need a dashboard to work for you. That’s why it’s so crucial to have something that covers all the bases–an all-in-one solution. For anyone attempting to manage multiple social media accounts on native platforms, you’re not only wasting time, but dividing your overall marketing efforts. And even though social media managers are superb multitaskers, there comes a point of prioritizing consistency across profiles. In a survey from Yesmail, 91% of retail brands claimed ownership of at least two or more social channels. And while every one of your profiles has its own needs, you shouldn’t give more attention to one over another. Your brand has to maintain a consistent presence across all of your profiles, not just a select few. 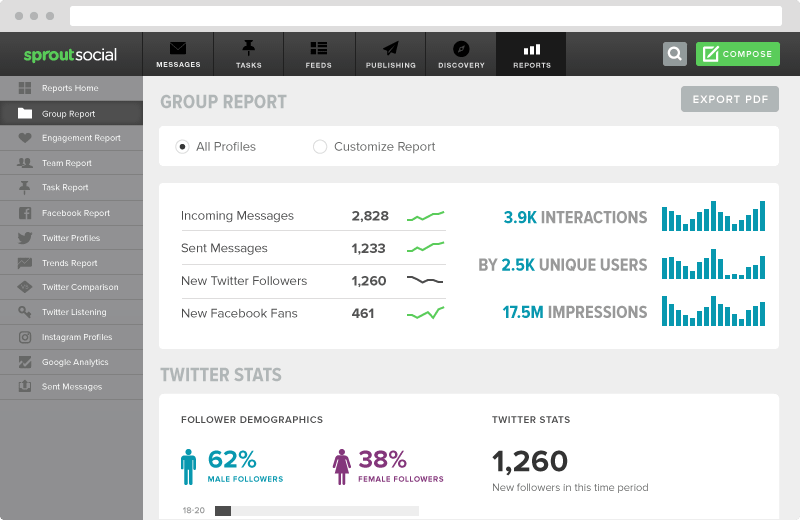 A good social media dashboard meshes your networks together to inspect data per channel or all together. Whether it’s analyzing posts, hashtags, sentiment or engagement, logging into various networks to get this data is incredibly inefficient. That’s exactly why Sprout Social built the Group Report. Brands need a space where they can compare and analyze overall social strategies across networks. In our report, it’s simple to gain critical insights by aggregating common metrics across channels and timeframes. If you’re serious about your brand’s social accounts, use a dashboard that can manage, monitor and analyze them all from one space. For brands looking to invest in a well-rounded social media dashboard, having the ability to schedule content should be a must. 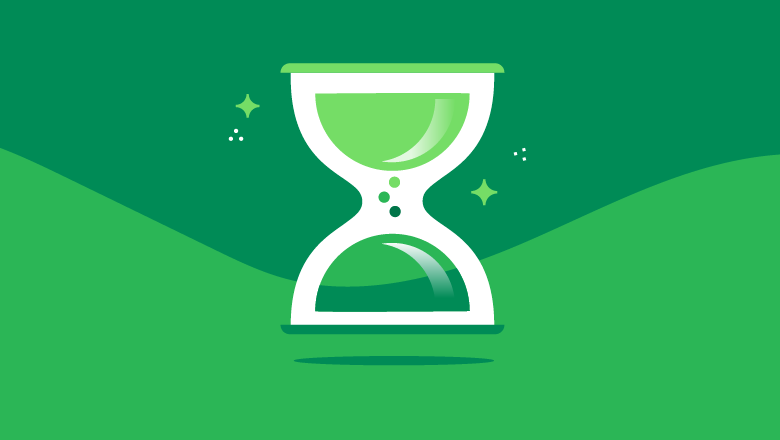 Planning content ahead of time allows you to be flexible and saves you from scrambling to find content to share at the last second. 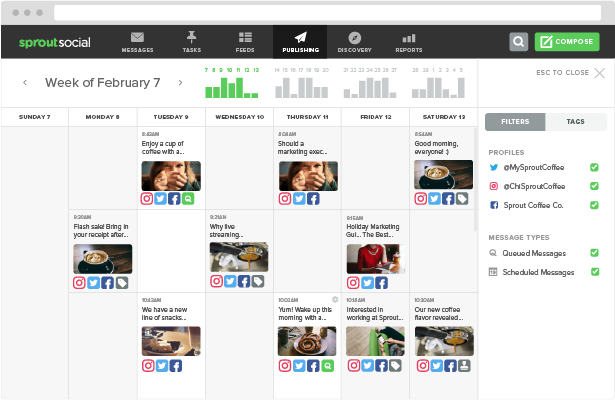 With a social media dashboard, you’ll be able to get a high level view of all your scheduled content from a daily, weekly or monthly view. Organizing your content into a social media calendar is a great way to ensure you’re publishing at an effective rate. You can easily spot publishing gaps, posts that are too close together and other potential issues you may have overlooked when you originally scheduled your content. Posting frequently without rhyme or reason will only weaken your online presence and minimize your chances of getting engagement. With organic reach on many social platforms dwindling down, getting strategic about when you post is crucial. Use your social media dashboard to get a high level view of your scheduled content, then make any adjustments as necessary. You know the benefits of hashtag tracking and why every social marketer should care, but how do you combine it with your social media dashboard? On top of that, what about your various social campaigns and how do you know if people are associating your brand with specific keywords? Hashtags are commonly used across all the major social channels and having access to performance on both inbound and outbound data is key. Your social media dashboard should provide you with the most insightful data on your campaigns, keywords and hashtags. Trending Keywords: What keywords are specifically mentioned with your brand and social profiles? A simplified overview of this data helps brands prepare for future campaigns, monitor product launches or simply listen to industry conversations. 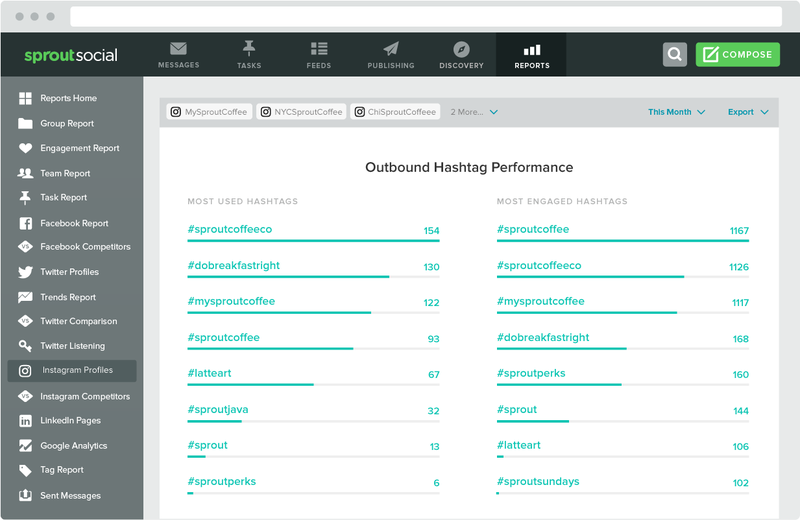 Hashtag Performance: What are your most used hashtags? Which hashtags drive the most engagement? Performance data outlines what’s working and can help you benchmark for future campaigns. Tagged Message Data: Brands launching one or several campaigns likely want to tag each message associated with a campaign. Data into each campaign should showcase publishing volume, engagement metrics and data on sent and received messages. Offline Social Campaigns: These words together might seem rhetorical, but a solid dashboard will also help track the success of offline campaigns. When you use hashtags on TV and print ads, how do you measure them? Keyword and hashtag analysis should provide insights on a dashboard. Facebook and Twitter both provide in-depth analytics on their native platforms. But again, many brands have multiple profiles and use several different networks. It’s important to understand how all of these accounts perform in relation to one another. Plus, it’s much more convenient to look at all your data in a single location. Another important aspect to keep in mind is not every brand tracks the same metrics or uses the same KPIs. Your social media dashboard should provide a range of reports and metrics, so you can get the data that’s most important to your brand. Whether you want Instagram analytics, engagement metrics or even competitive analysis, you can get it all with a dashboard like Sprout Social. Remember, dashboards organize your data which makes it easier for you to spot opportunities and optimize your strategy. When was the last time they posted? How long do they wait to post new content? How often to they respond to comments? Analytics are critical to understanding your business landscape and improving campaigns in the future. So make sure your dashboard has more than simple vanity metrics available for your brand. A major benefit to social media dashboards brands often forget is the ability to actively measure your team’s performance. Enterprise brands typically have larger teams working across a single dashboard with different accounts to manage. But for the C-suite, how easy is it to measure, benchmark and analyze your own team’s efforts on the dashboard? Is your team missing critical opportunities to further engage? A great dashboard will tell you. For agencies managing clients, you can improve relations and increase trust by using clearly defined user roles. These features help brands establish hierarchy and grant specific access to certain features. Like we mentioned before, team collaboration is essential to a successful dashboard. But not every member needs each feature. That’s why it’s important to have a dashboard that provides individual access levels custom to each user’s role. 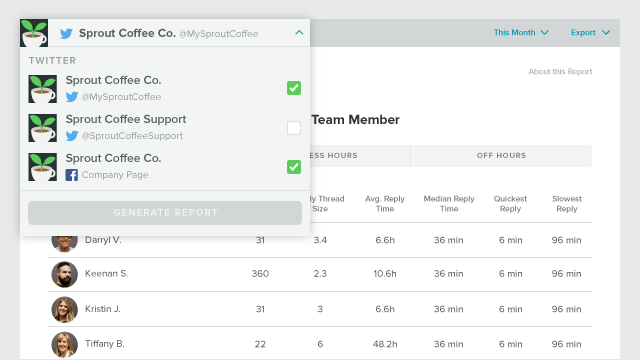 This provides visibility across the entire team and keeps your social media management efforts structured. A poor dashboard is one where your entire team has to share a password. Don’t sacrifice your security. 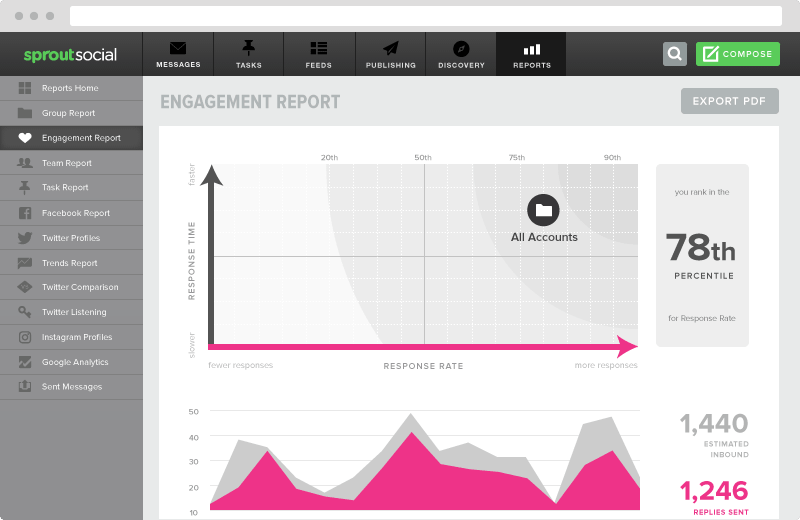 Control your social tools with a flexible social media dashboard. Some of the most crucial data you can pull on social media is about your audience. Who’s following you on Twitter? What age group engages with you the most on Instagram? How many new followers did you gain over a specific social campaign? 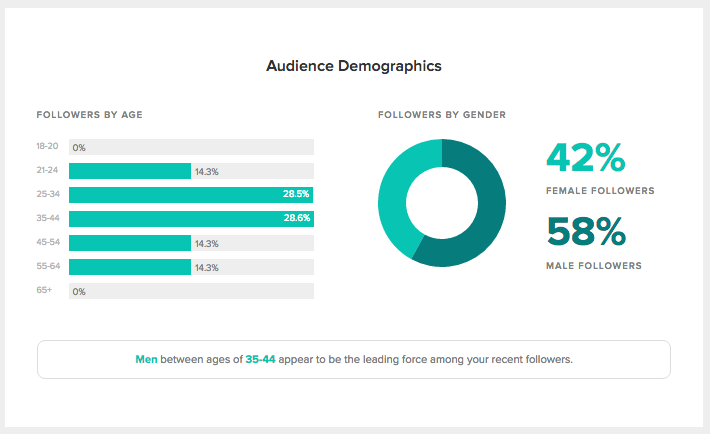 Understanding your social audience demographics provides insights into future campaigns, who engages with your brand and whether or not you’re targeting the right group of people. Every business has it’s own unique group of people they want to target. And tracking your audience to make sure you’re reaching that audience on social media is extremely difficult to do without a powerful social media dashboard. 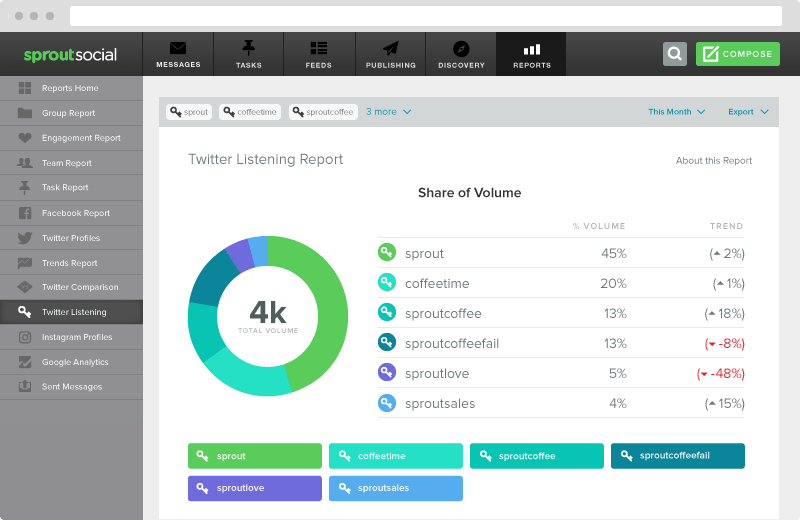 With Sprout Social, our data shows the various metrics that make up your follower base on social media. For marketers serious about social, insight into this data is a must to make sure you’re segmentation strategy is actually working. Additionally, social media dashboards should track audience growth over specific periods of time. If you’re running a campaign lasting two days or two months, you want to ensure you can pinpoint growth data on a dashboard. Customization is key for dashboards and if you can’t specify your date ranges or networks, you’re likely using an underwhelming tool. Last but not least, your social media dashboard has to present your brand a positive return on investment. A solid dashboard should help you eliminate repetitive tasks and save time throughout the week. But what about monetary value? Brands are constantly looking for ways to measure the value of social media. If there were a clear cut answer, we’d surely know by now. But maybe it’s not about measuring the value of a Like or Retweet. Instead, you have to look at your social media strategy as a chance to do things like build your audience, drive awareness and get more traffic. You need to figure out what your brand wants to accomplish on social media before you can measure any value. Once you’re set on your own brand goals and what you think success looks like, it’s time to measure your efforts. You should be able to answer all your data questions with a powerful social media dashboard. Possibly the best benefit to a dashboard is knowing you have an answer to what you value in your social strategy. Here at Sprout, we think we’ve got the perfect tools for you to succeed. That’s why we provide a 30-day free trial to let you see just how beneficial our social media dashboard can be for your brand. Be confident in your analysis. Get there with a social media dashboard you trust.